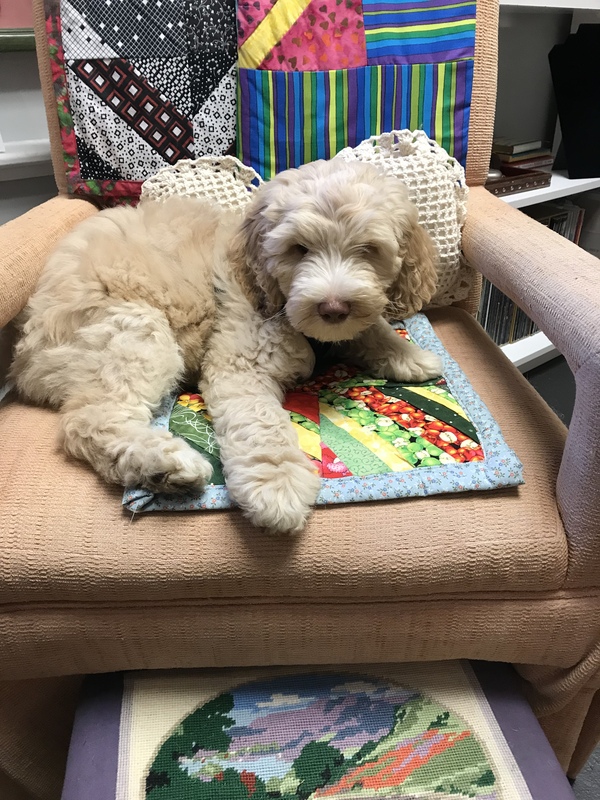 OPEN STUDIOS -July 7–8. This weekend! Maps available in my studio or online at hullartists.com. She produces paintings in a very unique medium–fused plastic–actually made from recycled plastic bags! You can see her work and mine plus 38 other artists at the Hull Artists 23rd Annual Open Studios Tour on July 7-8 and August 18-19. Free catalogues at Hull businesses from early June on. 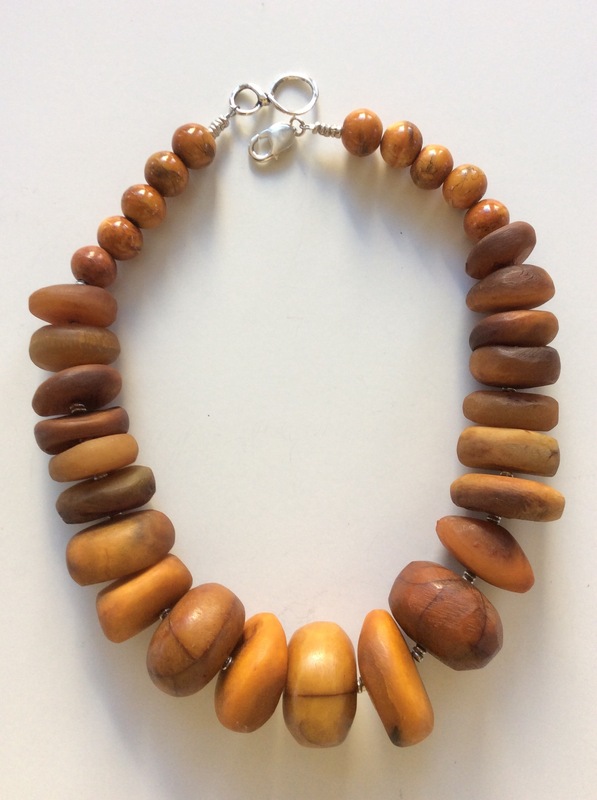 One of the treasures I found while revisiting the Amber drawer was some faux amber beads I found in an outdoor market in Bhutan, a landlocked Himalayan nation in South Asia. Its 800,000 citizens are surrounded by India, Tibet and Nepal. They are peaceful Buddhists. Instead of GDP, Bhutan measures Happiness. 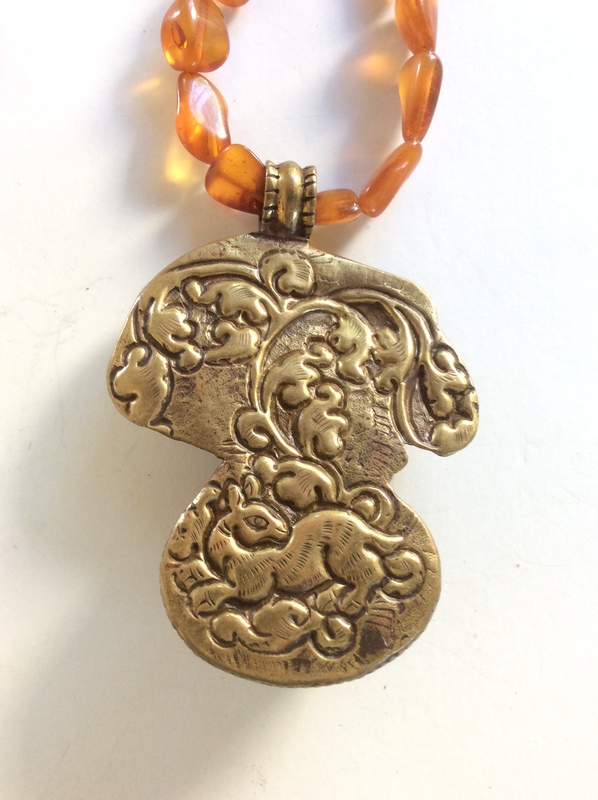 I knew the necklace was faux, but I bought it for the memories, not only of scenic Bhutan, but of the last trip Don and I made together before the ravages of Alzheimer’s disease were unleashed. Now, five years after Don’s death, I release these beads into the world. May they be someone’s personal measure of Happiness! It was a gift of the two-toned resin beads from fellow artist Donna Goes* that made me think of the Bhutanese beads and I think they pair well together. I added sterling silver beads and a Tibetan centerpiece of copal with pretty silver work. Ah, copal: another twist to the Amber story. For 23 years, I have described it as “young amber,” just to make it more understandable to my clients, but always labeled it as copal. Now that I’ve researched it, I was correct: it is tree resin, like amber, but has not completed its fossilization. 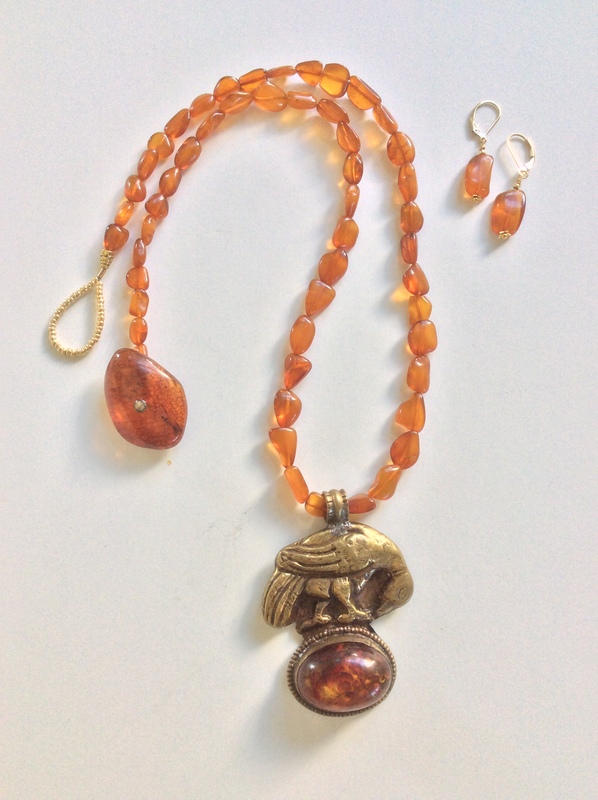 It is measured in thousands of years; Amber in millions. 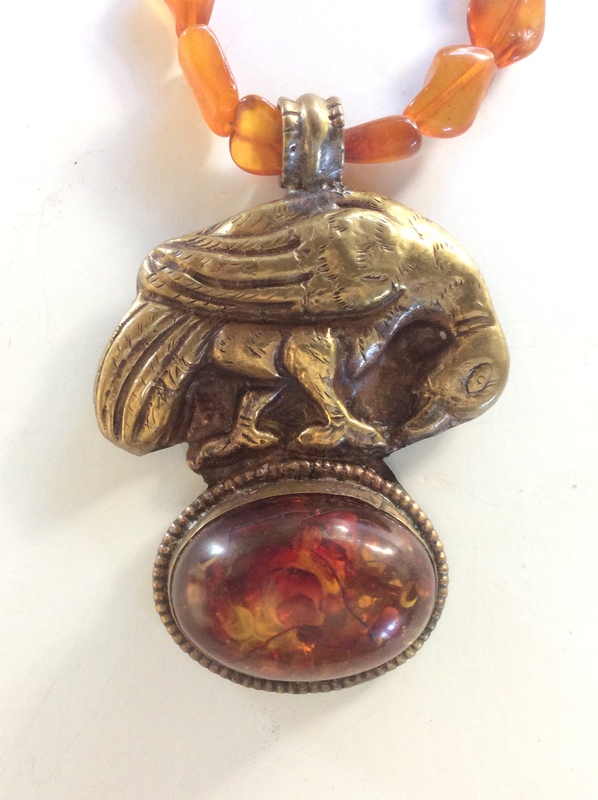 Copal is softer, opaque, citrine in color. Size of largest bead: roughly 5/8” from hole to hole by 1” high. Centerpiece: 1.75″ hole to hole by 1″ high. *Read Donna Goes’ story and see her amazing fused plastic paintings at www.luckylife.com. Heads up! Visit us both + 38 other talented artists at Hull Artists’ 23rd annual Open Studios Art Tour on July 7-8 & August 18-19. Why bother with unique clasps? Answers: it’s all about the hunt; it’s a challenge to put something creative at the back of the neck; it makes me stretch. 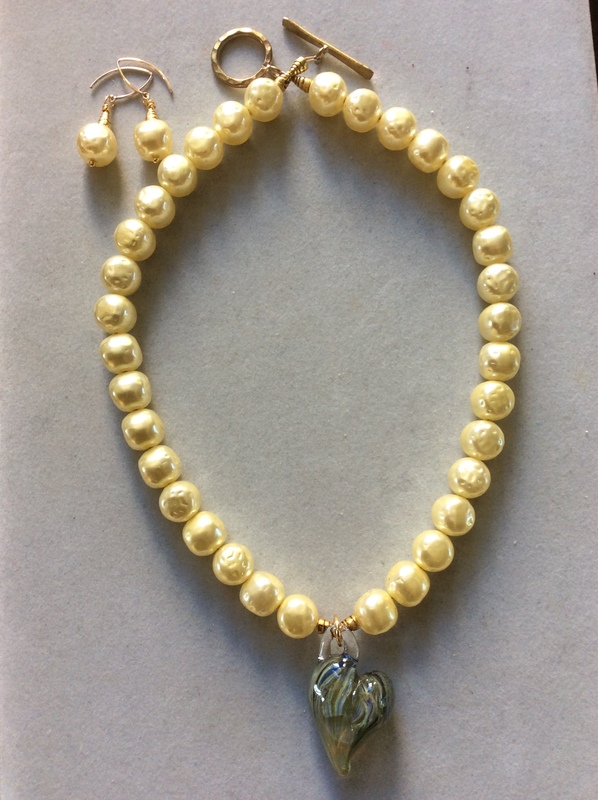 Anyone can use store-bought clasps or even seek out artist-make clasps at the big bead shows. I too use these old stand-bys for the majority of my necklaces. But it is fun to rummage through my drawers and cubbies to see what odd find can be made into a clasp. I made a decision early on that I didn’t want to create beads. 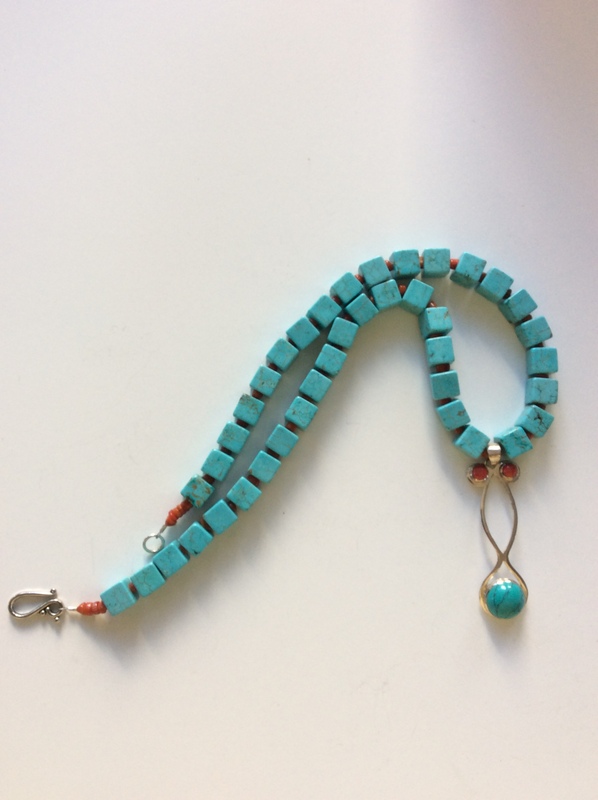 It suited my personality to engage in a hunt for the odd, quirky, overlooked, repurposable, full-of-character item that can function as one part of a clasp—either the circle or the stationary part or the toggle or moving part of the clasp. Yes, I am a collector. My finds are my treasures. 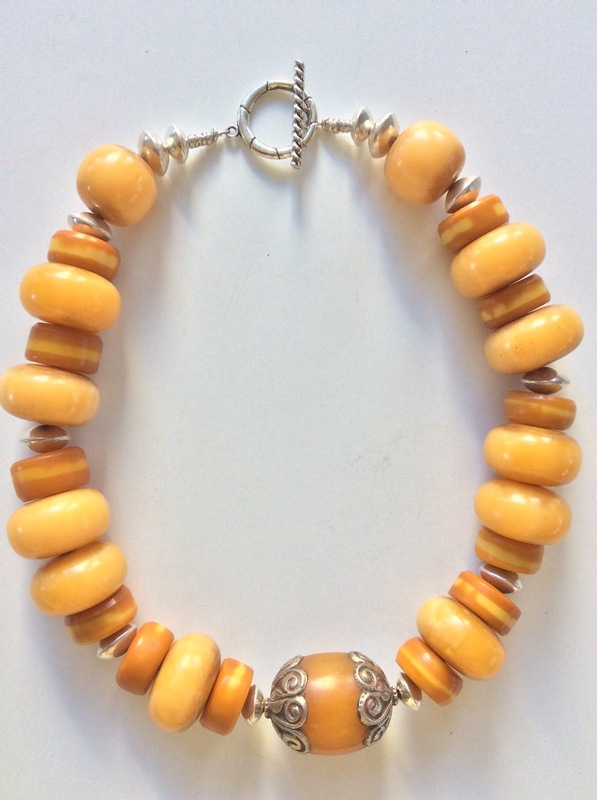 This particular clasp find is a 1960’s vintage plastic circle that was a good color match to the necklace. Plus, it added texture to the already-rich necklace: look closely at the crisscross pattern. I designed the toggle part of the clasp from sterling silver wire. The centerpiece is thick handmade glass I purchased in Murano, Italy, with a distinctly aqueous pattern in bold tones of aqua and pale grey with some darker streaks. It is 2” diameter. In a stroke of great bead karma, Drawer 15 (Grey) contained the palest shade of grey faceted Czech glass beads which are the base of the necklace and speak to the centerpiece. 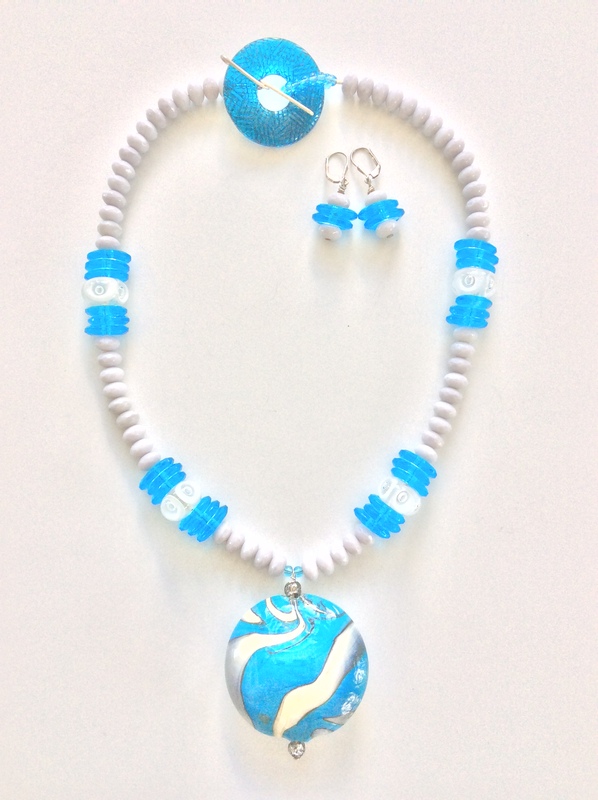 Also note the four artist-made lampwork glass beads bookended with rare vintage Italian oval glass beads in aqua. Featured beads are described above. 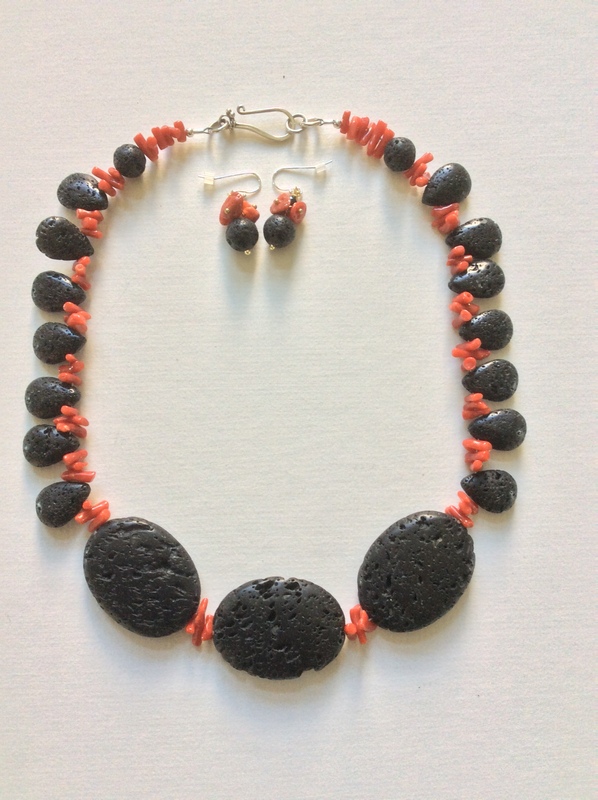 Matching earrings with 7/8” dangle are included. I made a trip to Murano & Venice in 2013 and blogged about it here on June 29, 2013. 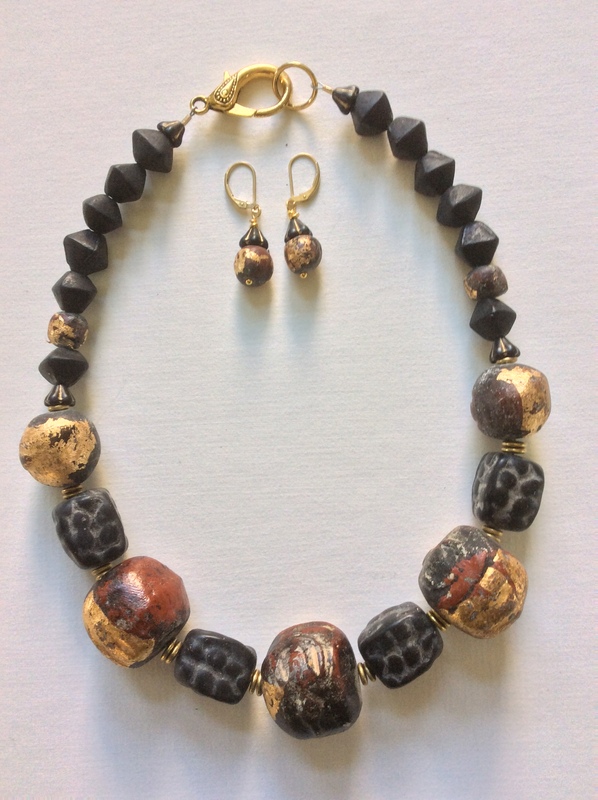 Let me count the things I love when creating necklaces: creative clasps, asymmetry, chunky beads, bold statements, anything that puts a smile on one’s face. 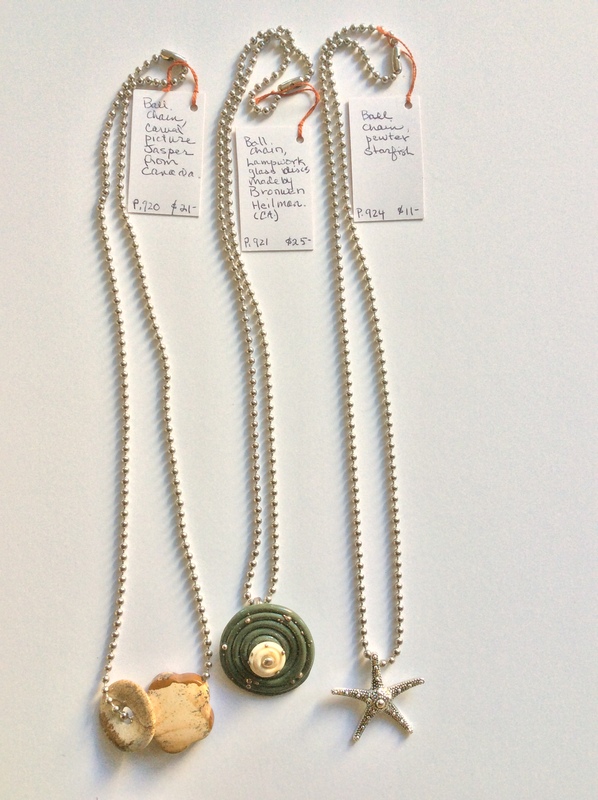 I have a saying in my studio: “Life is too short to make boring necklaces”. I’d rather have fun mixing up colors, styles, throwing in some whimsy, and presenting the resulting creation to the public. I’ll admit I was pleased with this necklace. 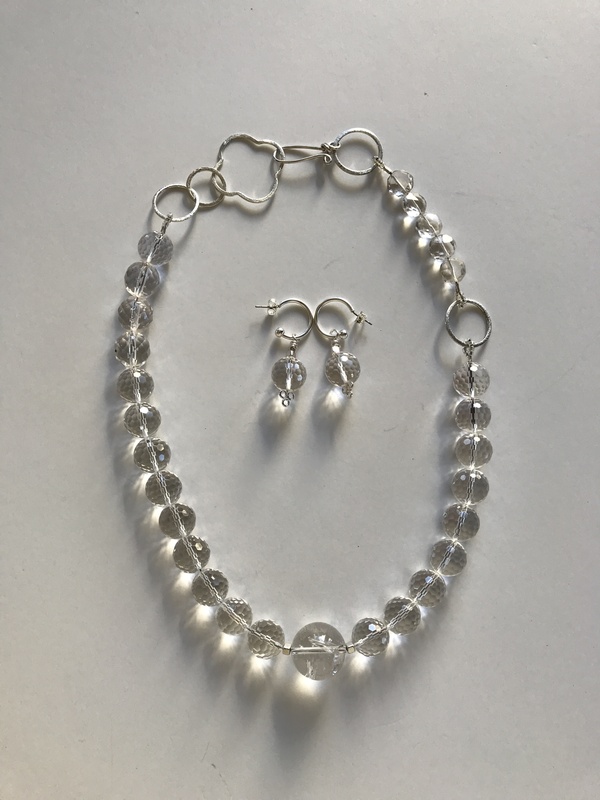 The beads are rock crystal and faceted (more unusual than smooth); the necklace is asymmetrical, and possesses a creative clasp I bought last year and have been eager to use! It hit a lot of the things I love! Rock crystal is also called natural crystal. Natural crystal is a quartz without other minerals present. It was formed when molten rock magma cooled beneath the Earth’s surface and crystals formed. Over time, other minerals infiltrate the natural crystal, add color and the results include well-known semi-precious stones like: amethyst; citrine; rose quartz; smoky topaz, to name a few. Crystals are favored by healers. Rock crystal is associated with balance, clarity and energy. February 15: Cut some Ball Chain, Add a Centerpiece! My Blog Plan for 2018 is based on a first of the month posting of a special necklace and its story which was also 2017’s plan, only weekly. I also thought I might post a more lighthearted piece of work mid-month. There is nothing more lighthearted than ball chain. My first exposure to it was a lucky rabbit’s foot I received as a birthday present as a kid. 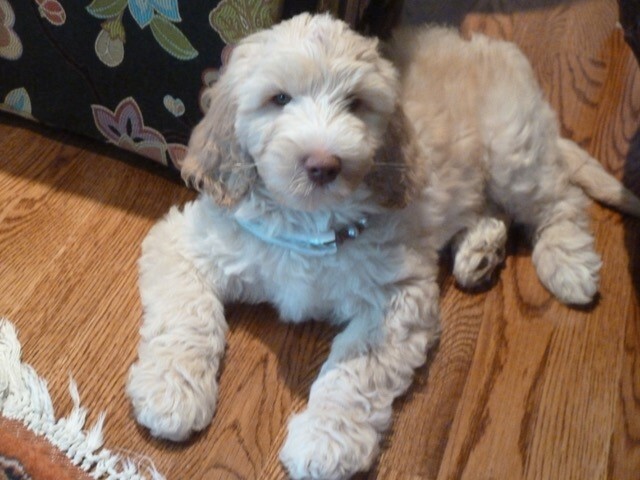 Today such a gift would have PETA picketing outside our family home. I just attached it to my pencil bag and petted it for good luck. Otherwise folks used it to keep their keys together. Maybe it should have been called key chain? Or dogtag chains? Or pull cord chain? 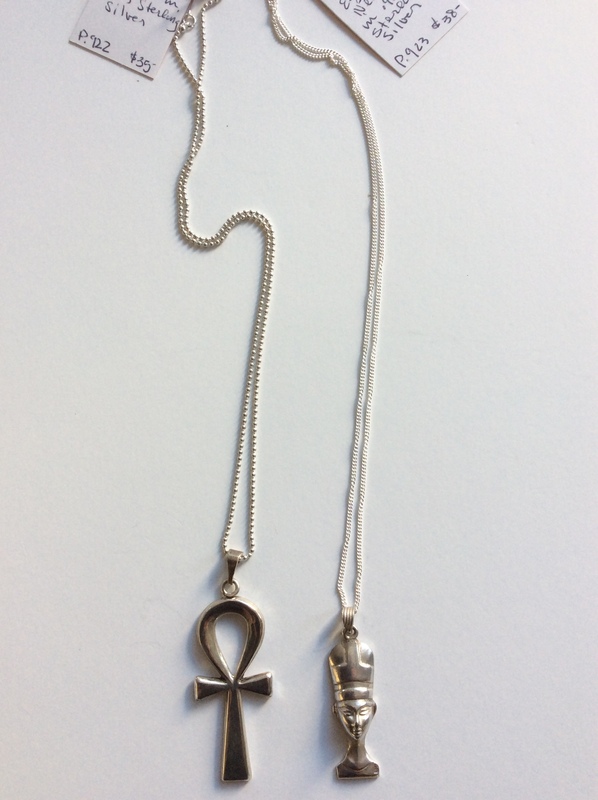 My selections from the top include fancy sterling silver ball chain with the Egyptian Ankh and Nefertiti pendants. 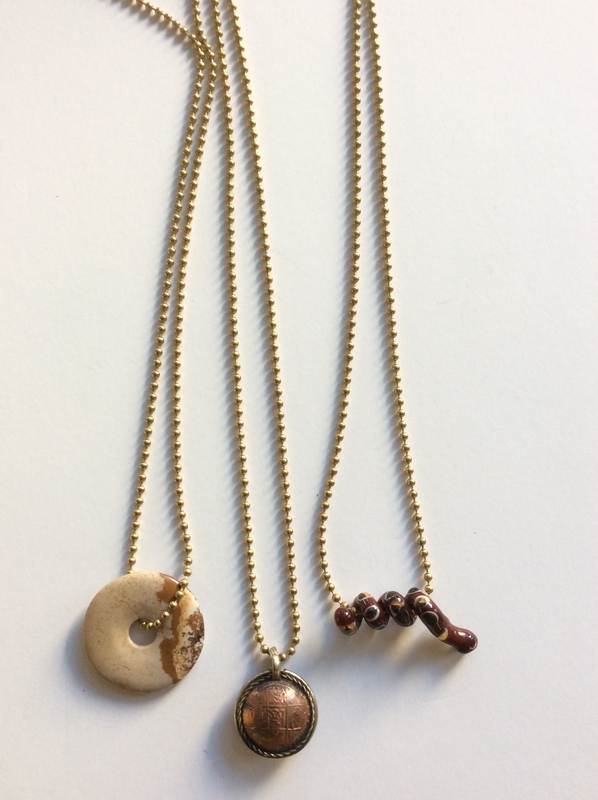 Then three brass ball chain 24-6” long, with picture jasper, brass and copper, and ceramic snake pendants. 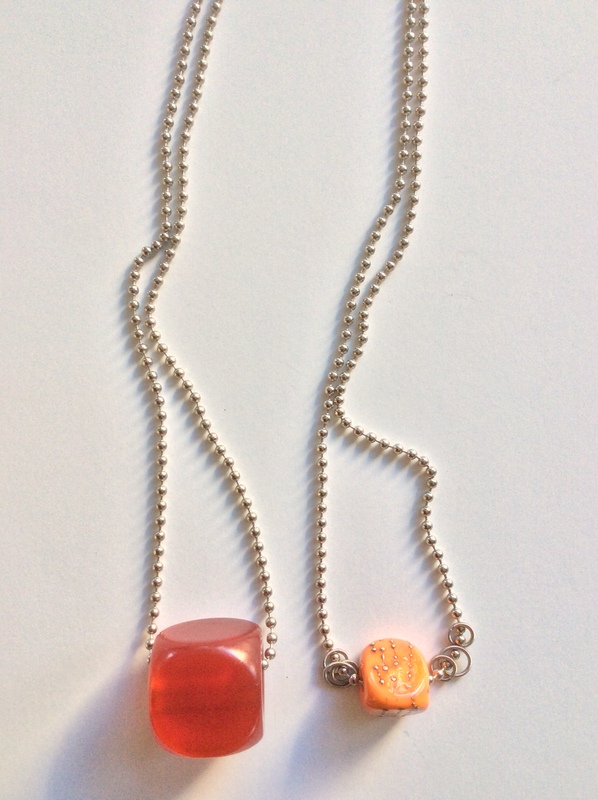 Next, 36″long ball chain with faux Amber resin and lamp-work glass with silver dots. 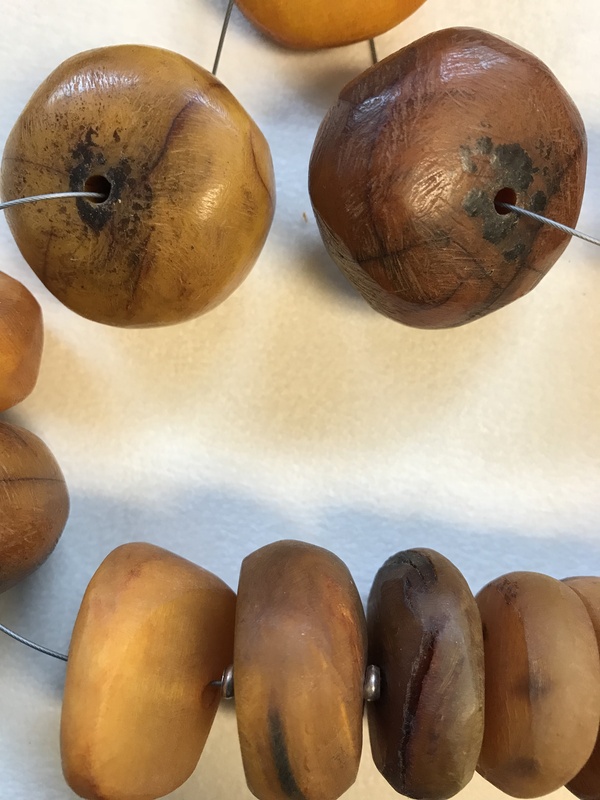 Finally, ordinary ball chain with picture jasper, lampwork glass and pewter in 24-6″. Ball chain really keeps prices down! They range from $11 to $25. The top two sterling silver are $35 and $38, left to right.